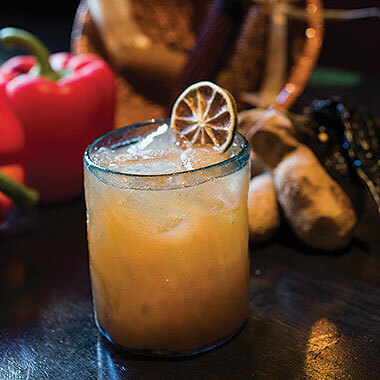 Montrio Bistro’s Anthony Vitacca concocts creative sips with equally inventive names. 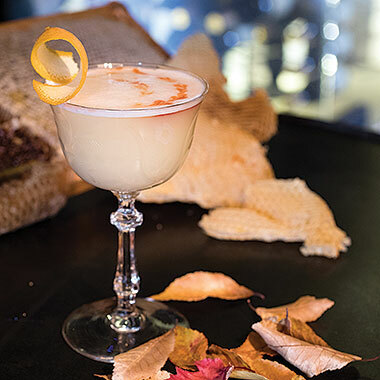 Monterey Bay’s craft cocktail scene makes an impression with ingredients and inventiveness. 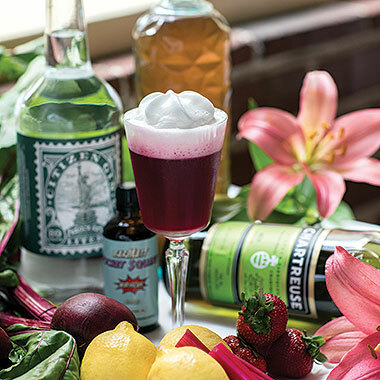 Anthony Vitacca was crafting his own maraschino cherries and steeping his own bitters long before the word “mixology” became mainstream, and his Montrio Bistro in Monterey remains a perpetual cocktail destination. His latest drink menu provides another tidal wave of wow, with creations like “If You’re Not Into Yoga” — with, gulp, 86-proof Hamilton Demerara rum, Fernet-Branca, charred pineapple, lemongrass, all-natural Noosa coconut yogurt, ‘Elemakule Tiki bitters, Fassionola syrup, coconut water, and fresh orange — and the “In ‘Spain’ in the Membrane,” a fusion of savory Spanish gin distilled with rosemary, thyme, olives, and basil and the Italian aperitif Italicus Rosolio Di Bergamotto. The recipe to keep the scene evolving, he adds, isn’t as easy as it sounds: Stay humble. “Just as in life,” he says, “listen, communicate, observe. Sounds simple enough. But we bartenders have something called ego that sometimes gets in the way. I have learned over the years there is always a better way — always a better recipe, and always a better attitude. Vitacca weaves together strawberry-and-rhubarb-infused gin, green chartreuse, roasted beet juice, BarMatt hibiscus bitters, elderflower meringue, and fresh lemon for an insane taste bud experience. 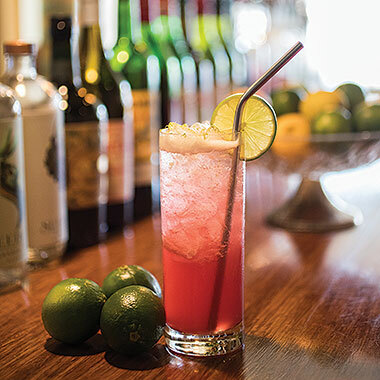 The open-air hub at the swanky yet accessible Bernardus Lodge & Spa draws an alchemy of flavor for the “Stinger” from Vago Espadin mezcal, honey syrup, fresh lemon, and Angostura bitters. Other honey-inspired drinks (the hotel boasts its own on-site apiary) from the Colony Cocktail list include the EpiPen and Queen Bee. Jeninni doesn’t have a liquor license, but it more than makes up for it via its creative license (and a clever wine list). The cocktails transcend hard stuff with the lovable likes of the “Foreplay” with Contratto bitters (like a tastier Aperol) in a highball glass with lemon juice, craft tonic, simple syrup, and lime. Cultura bar manager Joshua Perry borrowed inspiration from Cultura’s heart home (Oaxaca) and ingredients from its geographical home (the Central Coast) for the Jengibre Rojo, or Red Ginger, a combination of red bell pepper, smoked chiles, ginger, fresh lime, and gin — though regulars often swap in one of the hot spot’s small-batch tequilas or mezcals. While views of the Pacific Ocean from the deck catch visitors’ eyes, drinks by award-winning barkeep Lindsey Greblo capture the imagination. 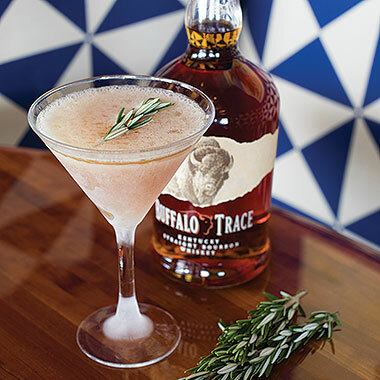 Like her blend of Buffalo Trace bourbon, smoked rosemary, a hint of cinnamon, sweet vermouth, and grapefruit bitters, which also won best in its category for the Monterey County Hospitality Association’s annual cocktail contest. 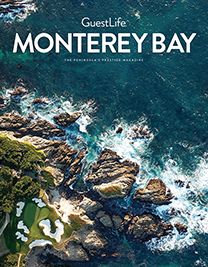 Discover the best places for craft beer with a good head on it — and good heads behind it — in Monterey Bay. From the opening tap, when ASB reinvented a decrepit theater in downtown Monterey as a sparkling pantheon to small-batch beer, and the addition of a hip production facility/tasting space in Salinas to the arrival of its immaculate (and massive) space in Carmel Plaza, this family-run operation has the beer scene dialed. That includes smart and flavorful pub fare, constantly changing new-brew creations, and popular standby beers that score big at the Great American Beer Festival, like repeat-winner Mai Tai PA.
Local favorites Mad Otter Ale and Carmel Valley Brewing collaborate on this brand-new spot in the Barnyard’s garden setting, surrounded by retail and restaurants. They flow half a dozen beers, including the flagship Mad Otter, a mild hoppy brew with refreshing balance and a citrusy finish. 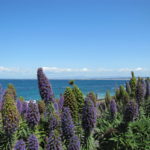 EA pioneered local beer for Monterey County and makes the most house-brand beers for area pubs and restaurants as a result. The funky brewpub in blue-collar Marina is a classic and a great place to enjoy one of the popular mainstays like the Fat Lip Amber or Big Sur Golden. Tucked away on an obscure corner under Portola Hotel on Custom House Plaza in Monterey, Peter B’s can be easy to overlook, but its flagship ales and ever-increasing menu of seasonal beers are hard for beer geeks to forget, particularly when paired with one of the most comprehensive happy hours in the area. Recent favorites include the Rock Me Amadeus wheat and the pulpy Great White Buffalo. More than 80 beers from dozens of breweries park it and pour it at Monterey County Fair & Event Center. Major beer companies descend on the grounds as well as lesser-known yet impressive brewing businesses, both local and from around the world. 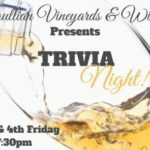 Fun fact: The fest benefits the Monterey County Fair Heritage Foundation, a 501(c)(3) organization that provides funding for educational programs and youth scholarships. Twenty-five-ounce mugs of craft beer may be the major draw at one of Monterey’s most popular haunts, but what comes along for cheers is bratwurst and live music for a celebration that runs till 11 p.m.